We also asked each participant to rate themselves on their effectiveness at giving others honest feedback. The chart below shows the percentage that agreed with the statement “I would rate myself as highly effective at providing others with honest, straightforward feedback.” We created the bars by using the two scales, “gives positive and gives negative feedback,” and indicating the “tendency to avoid or give such feedback.” It’s clear from the percentages that those who indicated a preference for giving negative feedback felt they were effective at giving others honest, straightforward feedback. 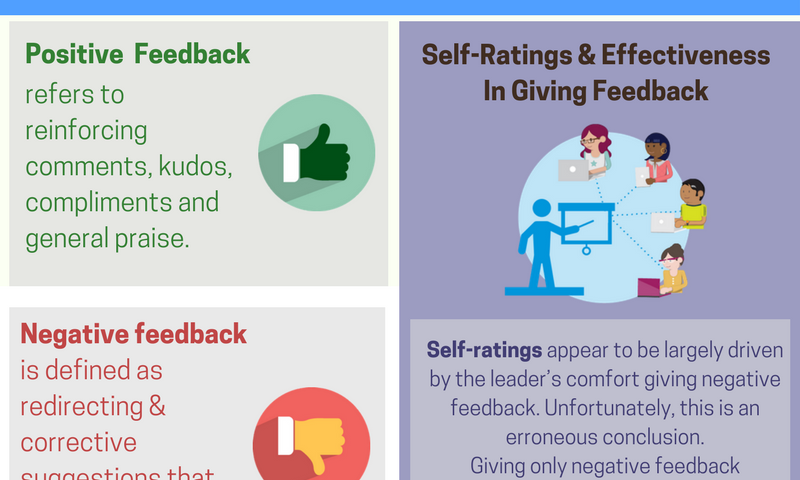 Self-ratings appear to be largely driven by the leader’s comfort giving negative feedback. Unfortunately, this is an erroneous conclusion. Giving only negative feedback diminishes a leader’s effectiveness in the eyes of others and does not have the effect they believe it has. After examining these results, we looked at the broader competency of “Developing Others.” In these results, we found the same trend (see the graph below). We then looked at a rating of overall leadership effectiveness. Again, we found a very similar trend. Effectiveness in developing others hinges squarely on the leader’s comfort and willingness to provide positive feedback to the subordinates. Giving corrective or negative feedback (or not) makes little difference if there is a clear presence of positive feedback from the leader.